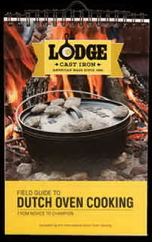 Log Cabin Campfire Cooking is a great cookbook with many recipes and helpful tips to make your camping experience unique. From breakfast to dinner and yeast breads to desserts, each of the recipes was prepared in competition and is tried and true. With excellent instruction given to each recipe, even a rookie can achieve mouth-watering results. -Someone like you could create miracles! In the rich tradition of outdoor cooking in the American West, the members of the Utah-based International Dutch Oven Society have assembled a great collectin of Dutch oven recipes. These remarkable breads, main dishes, and desserts represent a sampling of all-time Dutch oven favorites. There are dishes to challenge the most experienced outdoors cooks, as well as tried and true recipes for folks preparing their first Dutch oven meal. All have one thing in common; they are best prepared in Lodge cast iron.